Performers include: Sanaa Lathan, Stephan James, Stephen Moyer, Will Patton, Mack Wilds, Aisha Hinds, Clare-Hope Ashitey, Conor Leslie, DeWanda Wise, Richard Dreyfuss, Helen Hunt, Jill Hennessy, and Dennis Haysbert. A mystery drama thriller, Shots Fired is a 10-hour limited series which explores the tense aftermath of two racially charged shootings in a small North Carolina town. 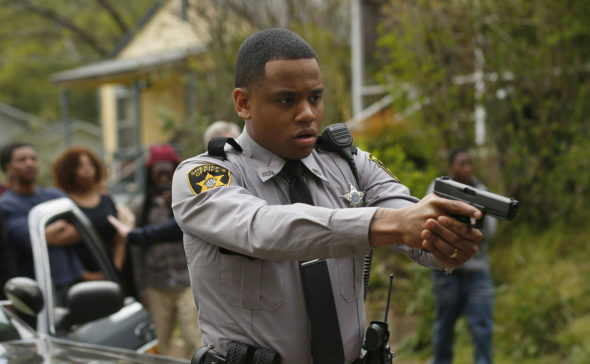 When African-American Deputy Joshua Beck (Mack Wilds) shoots and kills an unarmed white college student, it unsettles his small town. Before the community comes to terms with the disturbing incident, the media shines a spotlight on the overlooked murder of an African-American teenager. As tensions rise, the Department of Justice launches an official inquiry and assigns experienced investigator Ashe Akino (Sanaa Lathan) and young Special Prosecutor Preston Terry (Stephan James) to the case. While investigating, they find indications that there may have been a cover-up, involving prominent people. Governor Patricia Eamons (Helen Hunt) is in a tough race for re-election, and the shootings are only exacerbating her campaign’s struggles. Meanwhile, privatized prison owner Arlen Cox (Richard Dreyfuss) is a successful real estate mogul who is drawn into the heated debate of local policing. Seasoned Sheriff’s Department veteran Lt. Calvert Breeland (Stephen Moyer) is also entangled in the investigation. Ashe and Preston must navigate the media scrutiny, as well as the public debate, and deal with the community discord which arises from such volatile cases. The hearings for both cases are held and, as Preston presents the facts to the jurors, the truth behind each shooting is revealed. Meanwhile, Pastor Janae and other petitioners gather outside the courtroom in anticipation of the results, hoping for a better future. After the Sheriff’s Department loses one of its own, it becomes clear who is really to blame. First aired: May 24, 2017. What do you think? Do you like the Shots Fired TV show? Do you think it should have been renewed for a second season? It should be renewed and they should’ve put shots fired on BET instead of FOX a lot more people would watch it. I really LOVED this show and it’s all about what is really going on whether through police brutally, in school (HINT** CHARTER SCHOOLS) and the community in general, RACISM happens ALL OVER. I loved this show. Amazing how you love a show and it gets cancelled and you hate a show it gets renewed. Who decides? I waited and waited for Shots Fired to come back with season 2 just to find out it has been cancelled. You might as well take season 1 off Hulu. It is like giving a hungry person a taste of food and take the rest away. Two thumbs up!!! Bring it back! !